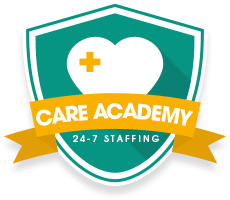 24-7 Staffing is delighted to announce the launch of our new Care Academy. Following the launch of our Healthcare department, we quickly acknowledged the lack of trained care workers available to our clients, within the South West. We have launched the Care Academy to help fill this gap; providing a range of free training to those who are interested in developing a career within the Healthcare sector but lack the relevant skills or qualifications. By offering this opportunity to potential care workers and local nursing homes, we aim to fill the void left by the current skills shortage, whilst also giving great incentives to the nursing homes who are assisting us with the practical training aspects. Our main aim is to help fill the shortage of care workers and assist people in forging new careers in the Healthcare industry. FREE fast-track on the job PAID training. Support and practical experience from experienced care professionals. Opportunity for a permanent role and pay rise at the end of the 3 month training period. Work with our key existing care home clients, providing practical on-the-job experience on minimum wage for a period of 3 months. Visit our office and attend theory training sessions to understand and meet the minimum standard for care workers. Work placements will be shadowed by an experienced staff member until they have completed the 3 months. A free uniform complete with a security ID badge and “Academy 24-7 Staffing Trainee” badge. A care trainee worker at a reduced rate for 3 months. The opportunity to keep the trainee at the end of the 3 month period for a reduced rate. You can train as many people as you like. At the end of the 3 months, if for any reason you choose not to take on the trainee, 24-7 Staffing will reward you for the training provided. It will give you a fantastic PR opportunity.